Yesterday (I don't know how I missed this!) Cardiff announced a new release of their Teleform product. This is good news for them, since there had been fears that Autonomy, the parent company would not really understand the importance of this piece of technology that they picked up with the acquisition of Verity. The value of the Teleform product (and similar products from other vendors) comes from its ability to automatically read handwritten and machine-print off of paper forms using ICR/OCR technology. The data that is read is matched with recognized form type and written out to a database or workflow, and the original form is stored to a document management repository. Automatic reading of paper presents a large ROI to many traditional paper driven business processes (like insurance claims), reducing the amount of manual data entry required and time to execute processes. Add to this that Teleform is integrated with LiquidOffice suite and Cardiff is truly able to claim consistent handling of paper and online electronic forms, which is essential for the slow but eventual migration of customer communications away from paper. The migration of paper to electronic application forms is a key requirement of New Account Opening, as most organizations could not switch off their supply of paper forms tomorrow and assume that a large potential customer base would switch immediately to online applications. After all, many of the target audience for high-value financial products like annuities are still in the age-group that distrusts technology, especially for transactions that involve large percentages of their life savings. For the industry in general that does not have a cohesive strategy for customer identity and electronic signatures, the need for paper forms remains. For a mixed paper and electronic scenario, LiquidOffice provides forms design tools and presents these forms online to enable the majority of an application to be completed electronically (directly by the customer, or by a sales agent). At the point that signature is required, LiquidOffice exports the completed form as a PDF, so that the customer can download it for printing or be sent a completed paper form, for a final wet signature. This outgoing form is typically captured into a document management repository and a BPM workflow case is created to manage the remainder of the often complex application process. When the customer returns the signed paper form by snail-mail, Teleform scans it, reads identifying information such as an application number and the paper form is matched to a current workflow case. 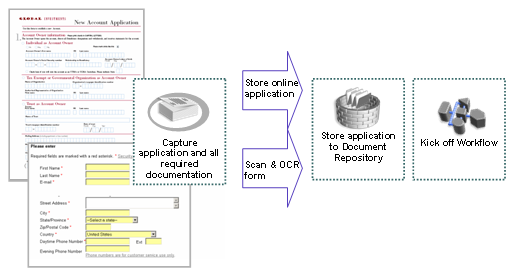 Had the whole application been paper, maybe on a form a customer picked up in a branch or printed online, Teleform would have scanned the paper, read its content and automatically entered a PDF image of the completed form into the document management repository to create a new BPM workflow case. No manual data entry would be required from the paper form. In reality there are handful of vendors offering very capable paper and electronic / intelligent forms capture systems. Cardiff's announcement just prompted me to talk about it with a name that is recognizable to many in the imaging and workflow industry. The approach described should be the front end of many New Account Opening processes as financial services companies attempt to move from paper to electronic applications. The days of paper are numbered but the shredded tree is going to continue for quite a while yet. I could not agree more. We are a Cardiff Teleform and Liquidoffice integrator and are using the same strategy to sell to potential customers. Customers see this value of paper to e-forms strategy and how the migration is painless and productive.